Waste bosses are urging Northumberland residents to think green this Christmas. 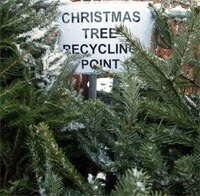 Northumberland County Council and SITA UK will recycle Christmas trees, cards, wrappings and drink containers. Household waste recycling centres across the county will be open every day except Christmas Day and New Year's Day, and Christmas trees can be taken along at any time and recycled with other green waste. There are county council household waste centres at Allendale, Alnwick, Bebside, Berwick, Haltwhistle, Hexham, Seghill, Ponteland, Morpeth, Hexham, Prudhoe, Wooler and North Sunderland. They are open 8am-6pm, with the exception of the Seghill centre, which operates 8am-4pm. Cards can be recycled in kerbside recycling bins, or at the centres along with usual paper waste, or can be taken to any WH Smith, TK Maxx or Marks & Spencer store in January. Glass bottles and jars can also be taken to bottle banks in towns and villages across the county. Meanwhile, a drive starts next month to persuade people in Northumberland to recycle more small electrical goods. By taking a small old electrical appliance such as a toaster, radio, iron or electrical drill to their local recycling centre during January, residents will be given a scratch card offering a range of prizes. The scheme, funded by the Recycling Electrical Producers Industry Consortium, is aimed at reducing the number of small domestic appliances which are put in bins and sent for disposal, by encouraging householders to take these items to their local recycling centre instead. Large appliances, such as fridges, freezers, cookers and washing machines are not included in the promotion, but can still be taken to household waste recycling centres. Richard Hinchcliffe, regional manager for Northumberland County Council's waste partner SITA UK, said: "While a great number of people are taking up the opportunity to recycle household waste, we are finding that too many small electrical items are being thrown away still. "At a time when people are replacing small electrical items more frequently than ever, we would urge people to recycle as much as possible. Much of it can be recycled and reused, proving a valuable resource that would otherwise go to waste."